The CBS ArcSafe RSA-167 is compatible with Allen Bradley 1494F-P1-NP Series A circuit breakers and allows technicians to remotely close or trip the circuit breaker from a safe distance while remaining outside of the arc-flash boundary. CBS ArcSafe®, a leading manufacturer of remote racking and switching solutions for low- and medium-voltage switchgear, introduces its remote switch actuator (RSA) for Allen Bradley 1494F-P1-NP Series A with non-metallic molded plastic recessed mounted operating handle circuit breakers. The lightweight, portable CBS ArcSafe RSA-167 allows technicians to remotely close or trip the circuit breaker from a safe distance of up to 300 feet while remaining stationed outside the arc-flash boundary. 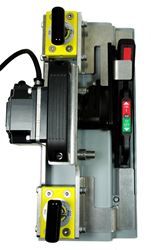 Installation and operation do not require any modifications to the existing electrical equipment thanks to CBS ArcSafe’s magnetic latching system. The RSA-167 is compatible with Allen Bradley 1494F-P1-NP Series A circuit breakers. Typical applications of these circuit breakers include fuse block disconnects and motor starters. The RSA-167 is a cost-effective solution for keeping operators safe when compared to other arc-flash mitigation alternatives.